Teachers who are eligible next year to receive tenure will not be judged under a new teacher evaluation program being piloted in Hamilton County, officials said Friday. "There's too much at stake," said Ava Warren, Hamilton County Schools' assistant superintendent for curriculum and instruction. She added that principals also should not use the new model if they anticipate a teacher getting a negative review. Staff Photo by Dan Henry/Chattanooga Times Free Press Dr. Kim Marshall, a nationally recognized education expert and author, speaks during a two-day training session for Hamilton County teachers held at the United Way of Greater Chattanooga on Friday. 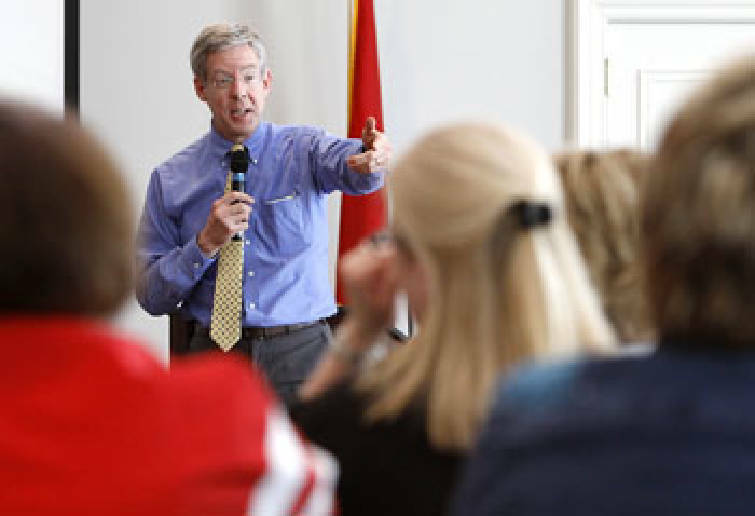 School officials, principals, teachers and union officials discussed some particulars of the district's new evaluation model during a workshop Friday at United Way of Greater Chattanooga. United Way recently received a $137,500 grant to improve education reform and teacher effectiveness and asked the school system about the best way to spend the money. School system officials already had brought in Kim Marshall, who writes "The Marshall Memo" newsletter about current research and practices in education, to discuss a new way of evaluating teachers, and suggested that United Way sponsor Friday's event to start figuring out the details of the evaluation system. The Ochs Center and the Public Education Foundation also are partnering in the effort. A 15-member group now is meeting in Nashville to discuss teacher evaluations to follow through on Race to the Top legislation. Hamilton County's evaluation system eventually may be used statewide since Normal Park Museum Magnet School principal Jill Levine sits on the Nashville committee. Hamilton County Education Association President Sharon Vandagriff said the group that gathered Friday needed to keep in mind that the system might be used by administrators in districts other than Hamilton County. "We're an experimental laboratory. We're being looked at, so let's be mindful of that," she said. Connie Atkins, the district's superintendent for human resources, encouraged workshop attendees to first think outside the box about what would work, then focus on the rules and regulations that must be followed. Dr. Marshall told participants to consider issues such as how long a principal should stay during classroom observations, whether administrators should take notes and what exactly they should be looking for. Darlene Johnston, who attended the event at United Way and teaches government and economics at the Center for Creative Arts, said she was glad there was a variety of people pitching in on crafting the new evaluation model. One concern she's heard from teachers is about how the district will create one evaluation tool to effectively judge many different types of teachers. "My primary question is how to develop an instrument that encourages reform but retains fairness," she said. Lakeside Academy principal Marsha Drake said the new evaluations - which likely will include 10 to 12 short teacher observations throughout the year, versus fewer 45- to 90-minute observations - also will provide clearer expectations for teachers. "This really will assist them in becoming quality, high-performing teachers. Their expectations will be very clear. There will be no guessing," she said. One concern is for evaluators to make it into each classroom so many times per year, said Ms. Drake, who supervises a staff of about 50 at Lakeside. A committee of Hamilton County Schools officials will take ideas from the workshop and draft a teacher evaluation model to be piloted beginning this fall.